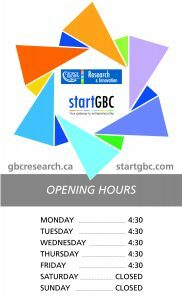 Welcome to the startGBC Collaboration Co-working Space! Free co-working space open from Monday to Friday, 9:30 am to 4:30 p.m.
Our role is to work with you, in partnership, to help you accelerate your growth and continue to develop your entrepreneurial mindset. Stay tuned for more information about the startGBC space offerings!